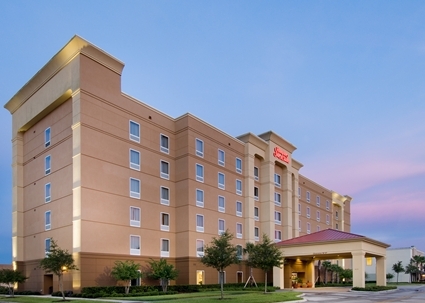 A block of rooms have been reserved at the Hampton Inn and Suites in Lakeland for the Renewable Energy Systems and Sustainability Conference participants. Please note that the block of rooms is limited and your reservation must be made no later than July 10, 2017. Take 275N to I-4E to Exit 27. Continue on Polk Parkway to Exit 5. Turn left onto Harden Blvd to 2nd traffic signal, turn left into Lakeside Village Mall. Our hotel is located behind Kohl's Department Store. 417S to I-4W to Exit 27. Continue on Polk Parkway to Exit 5. Turn left onto Harden Blvd. to 2nd traffic signal and turn left into Lakeside Village Mall. Our hotel is located behind Kohl's Department Store. Exit Lakeland Airport by turning right onto Drane Field Rd. Follow signs to enter the Polk Pkwy. (Toll Road). Stay on Polk Pkwy. to Exit 5, Harden Blvd. At end of ramp, left onto Harden Blvd. At 2nd light, turn left onto Town Center Dr. Distance from Hotel: 3.4 mi.